As I frolicked around my kitchen last night in my brand new and uber-fabulous monogrammed apron, making the world’s best Mexican Chocolate Cake to bring into my office this morning, JohnnyMac came in with my favorite toddler. After a hug and kiss hello, he asked me how my day was. Which isn’t a common occurrence. Especially when I am in the kitchen. And frolicking. And making baked goods. Me: I thought I was fine but it is hard to say goodbye. Him (after another pause): Isn’t that a Boys II Men song? The truth is, it is hard to say goodbye. I started this job almost four years ago. When I started, I knew very little about what I was doing. I certainly made big claims and acted confident. And it turned out beautifully. And then we merged with another company. And merging is great when it is an actual merger. Most mergers are actually acquisitions dressed up pretty like a merger so people don’t get their pissy pants on. Whoops, that never works. So we merged. And we definitely had greater leverage and greater opportunity to actually be greater. And then last year my particular team merged again. And moved offices. And we saw a bit more about change management. Change management is like watching a live viewing of Who Moved My Cheese. Guess what? No one wants to watch this. I had concerns, oh plenty. But there should be a pre-merger session for people called “Zip Your Yapper.” I know change is scary but we definitely had some pills on our side making many a vocal complaint. And many a vocal complaint doesn’t win you Employee of the Month. And once I moved offices, I found myself even happier in my role. And surrounded by a much larger group of people who were, well, basically fantastic. My previous office has great people, but this was a different kind of fantastic. More people my age. More people bringing great experiences, creativity and sassiness to the table. (And you know a table with sassiness is my kind of table.) And more people really working for the greater good of making our organization shine. And it really does shine but it does so on the backs of people who are giving far more than they are taking. Today is my last day here. And it is bittersweet because my new opportunity is in-cred-i-ble. And I couldn’t pass it up. And it is time for me to stretch and grow some more. But yes. Saying goodbye is hard. And for the record, the Boys II Men song is It’s so hard to say goodbye to yesterday. And well, yes, yesterday was full of well wishes, really great people telling me I will be missed (and I am pretty sure my supply of baked goods is going to be missed a great deal too..in fact, my baked goods merited their own greeting card) but also that precious apron, and those gorgeous shoe cookies so in a way, it is in fact hard to say goodbye to yesterday too. So thank you fabulous friends..new and old. Who now know about my blog (that has been under wraps from colleagues for well, almost exactly four years.) Those of you who I will miss the most know. 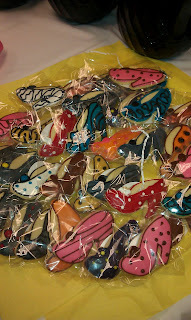 And thank you for making this experience what is was for me, all the way down to the fabulous shoe cookies! I have a great road ahead, but today won’t be weepy-free I can assure. Time to cue the Boys II Men song. And start sauntering through this office with the world’s best Mexican Chocolate Cake. If you are going to go out, go out big. Congrats on your new position! Hard to leave fabulous-ness behind, but how exciting to be heading to a new adventure. Congratulations on this new chapter in your life. Leaving is sad, scarey and exciting all at the same time. Best Wishes. Congrats! It is so hard to leave, but life is full of moving on. Hope you have great adventures (and lots of material for the blog) in your next "life". Love the shoe cookies. Did you remember to mention the shoe cookies? Good luck with your new venture. Change is always scary, but also very exciting? PS> Those shoe cookies look incredible! I think that was our "prom theme song." Change can be scary, but change is good. I love this post! I have been through so many changes at my job over the last 2 years, and though I love what I do and where I work, I continue to wonder down the road what opportunities may be waiting for me. I love your perspective on things. Good luck on your new job, and feel free to send some of those cookies my way! Wishing you the best on your new adventure. You are so fortunate to have had each new path be a blessed one! Congratulations on your new opportunity! Hope your new situation leads to many more clever and hilarious blog posts. I would like for you to come to work in my office, please and thank you. Anyone with sassy shoes and Mexican chocolate cake is my kind of colleague. Good luck with your new opp! Congratulations on the new opportunity. Change can be scary, but, oh so necessary for an interesting life. And the shoe cookies? What more could a girl want? shoes and Cookies....sign me up!!! good luck on the new adventure,.,,goodness knows you deserve it and the people you'll be working with now, LUCKY LUCKY people Jenny. Life is full of chapters in the large book of you! Another one down, many more to go. :o) Congrats JennyMac! I know you'll be a success.